Quesadillas have come a long way, baby. Back in the day (the 80s for me), restaurants that served quesadillas to us suburban folk stuck pretty much with overly salty cheese and maybe chicken. I thought they were the most boring of all Tex-Mex foods. Really though, they are a genius way to make the most of little bits of leftovers, and the flavor combinations are pretty much endless. This recipe is based on one from Sugar Dish Me (HERE is the original recipe) and we really like it. It has a great combination of flavors and is very high in good-for-you veggies. We used a very large, leftover sweet potato, some Swiss chard from our garden, leftover black beans and some chorizo sausage from Mae Farm. You can top your quesadillas with whatever you like. We are using our homemade tomato salsa and some unflavored Greek yogurt instead of sour cream. You could go vegan with this by leaving off the meat, cheese and sour cream and it would still be awesome. Warm a large skillet over medium heat. Add olive oil and bulk sausage. Brown sausage and remove to a paper towel-lined plate. Remove all but 2 tbsp. of the fat from the pan. Return pan to heat and add onions and Swiss chard. Cook for 2-4 minutes, until onion is starting to brown and chard is wilted. Remove from heat. Chop the chipotle peppers and set aside. Mash sweet potato flesh until smooth and set aside. 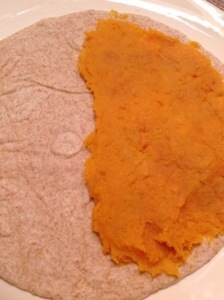 Spread sweet potato puree on half of each tortilla. Top sweet potato with about 1/2 cup of cooked sausage. Top sausage with onion/chard mixture. Top onions with black beans and peppers. Top the beans with shredded cheese. Fold the empty side of the tortilla over the filled side to make a half circle. Press down a bit to make it all stick together. Put filled tortillas onto a foil-lined baking sheet. Bake for 8-10 minutes. Use a pizza cutter or knife to cut each quesadilla into 2-3 triangles. Plate and serve with your choice of condiments! 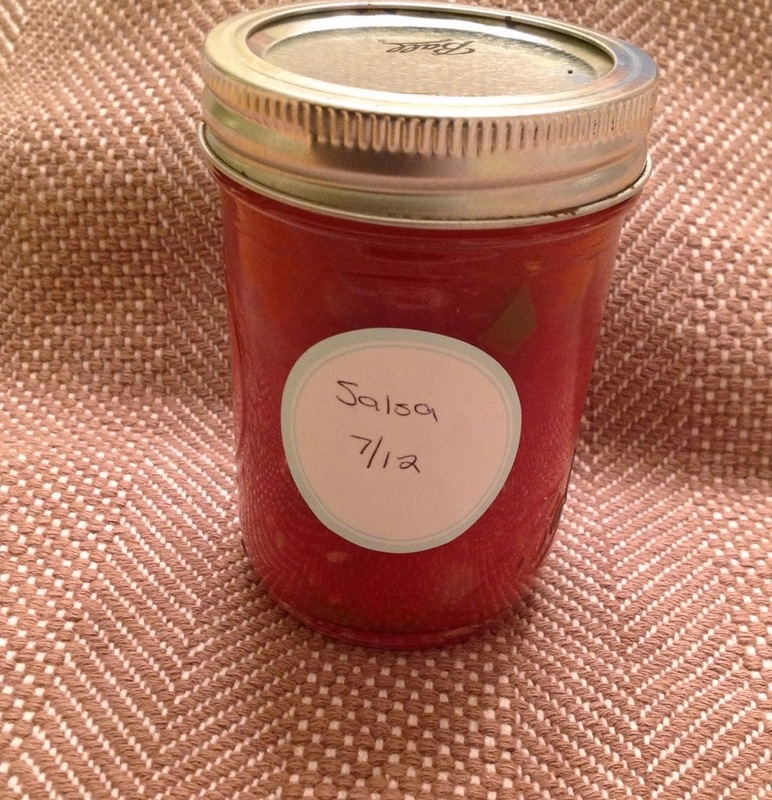 Chipotle chiles in adobo sauce!! OMG I love those things. These quesadillas are still one of my favorite recipes I’ve ever posted- love the addition of swiss chard!! 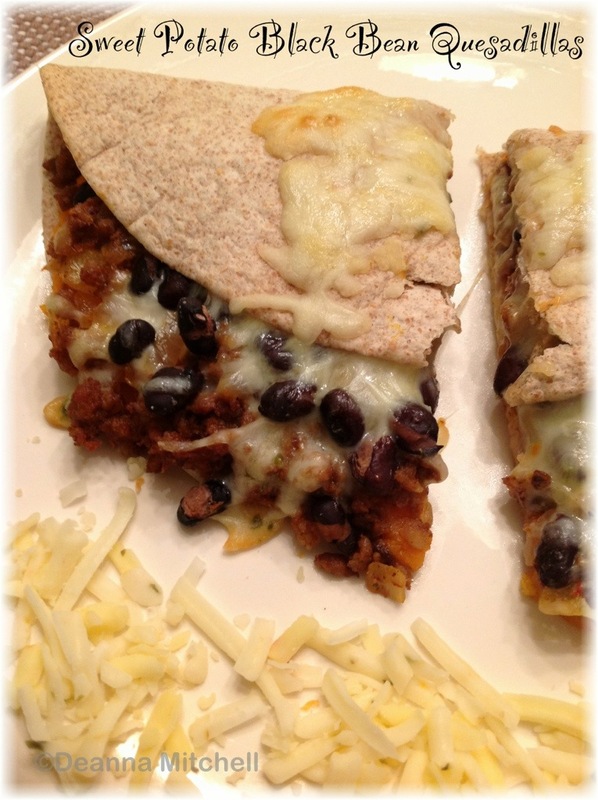 My kids are majorly boring Tex-Mex traditionalists… just cheese. Onions if i twist their arms. Lame. I’m amazed Ellie eats these, but she loves them. 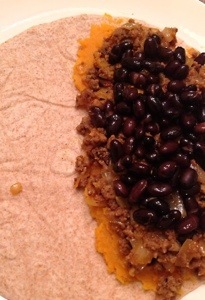 I think the sweet potatoes add just enough sweet to the spicy. I need to take a minute and find your post so I can link back to you. Forgot to do that–I blame the fog-inducing American Idol. Hahaha I’ve abandoned American Idol… maybe I should watch it though. I could use some fog. These look yummy – we usually use seasoned ground beef, black beans and corn, but I think the boys might like the sweet potato. Thanks for the inspiration!